‘MINDLESS’ vandals have launched a ‘degrading attack’ on a community hall in East Preston. Hoodlums plastered the walls of the village’s Conservative Hall, in Sea Road, with vile obscenities, some too foul and offensive to be printed. 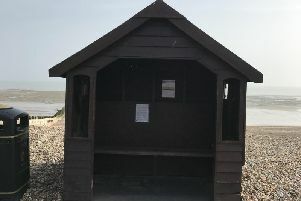 The attack has outraged Arun’s head of planning Ricky Bower who, as well as being the district councillor for East Preston and Kingston, is also one of those charged with running the hall. Mr Bower said: “It’s mindless ignorance. It’s not something that’s degrading the hall or the Conservatives, but it’s degrading the whole community. The vandalism is believed to have taken place on either Saturday, March 28, or Sunday, March 29. Mr Bower explained that this was not the first time the hall had been blighted by graffiti. In recent years – more commonly close to an election – vandals have taken to violating the building. “It’s not the first time but it shows the ignorance of those doing it,” Mr Bower said. “They seem to think that this is an entirely Conservative facility. “But what they fail to realise is that this is a community hall. Sussex Police are investigating the crime and have interviewed a number of people in relation to the incident. A clean-up operation has yet to begin, leaving villagers to contend with the obscenities. Fellow East Preston district councillor Terry Chapman was also shocked by the assault. “It’s extremely frustrating,” he said. “The hall has been there since 1928 and it’s always served the community. Mr Bower is now urging other villagers to remain vigilant against future attacks, not only on the Conservative Hall, but on other parts of the community, too. Sussex Police is appealing for anyone with any information to contact them by emailing 101@sussex.pnn.police.uk or ringing 101, quoting serial number 0899 of 20/03.